New version in Steam testing! If you already own this game and would like to test the shiny new bigger-and-better-backgrounds version on Steam, please email support@hanakogames.com with your receipt or order information. Callum's path ending structure has been changed. The 'normal' ending is now different (instead of being almost the same as the happy end) and has different requirements to reach it. Because of this, old saves made late in Callum's path might not work right. Because this game doesn't have an updater built in, I'm doing all the release testing on Steam where I can easily patch as necessary. However, if you already own the game and are not a Steam user, we will eventually be making this version available for normal download, just not yet. Stay tuned here and to the newsletter for updates. Please let me know if you encounter any problems or have comments about the new content! I've been playing the beta release and I must say-the new background art is so beautiful. It's been pretty smooth so far although I did find this one weird thing just now. 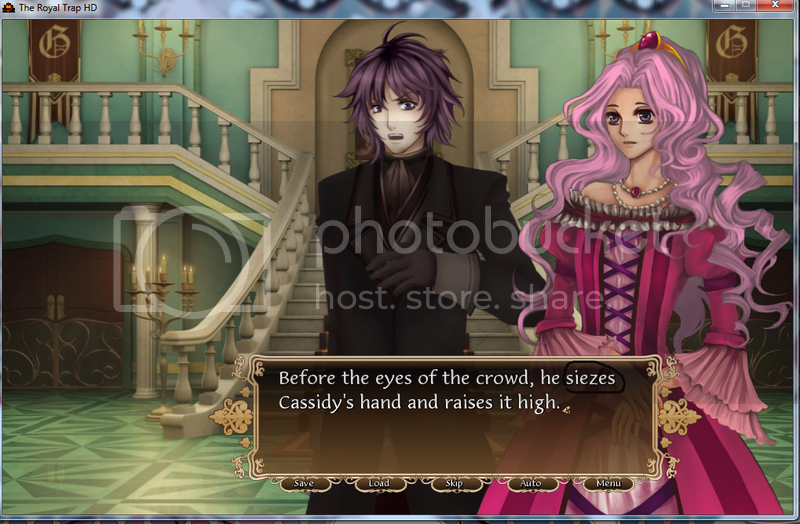 In the screenshot below, when Dolores' sprite is shaking, Madeleine's head sprite is moving, too. I don't remember this happening in the old version. Also, I noticed the shaking effect after I saved the file when this happened and I don't think that's supposed to be the case, either. Hmm.. while I'm not experiencing the EXACT same event as phoenixgirl, I'm at the point of them returning to the palace and Madeline's top half seems to be shifting back and forth. I've left it there for a few minutes to make sure its not my eyes playing tricks on me and I'm 99% sure they're not. I was able to make a .gif of it actually. http://gyazo.com/12e969dd68c57edbc155f8e8a474c342 I'll post the link because I'm not sure how to, or even IF you can post it so that it would actually play on here. I'm not really sure what's being posted there - all I see is a teeny tiny square of text, non-moving? This sort of weird twitchy thing, if it is occurring, might be a high-level video card issue happening on only some setups that we can't do much about, but I'm interested to know if it happens for other people. The Steam page is now up for this - http://store.steampowered.com/app/356530/ - although it won't be released just yet. I've been playing through when I can and I haven't encountered any more bugs, other than the weird moving effect. Perhaps it might be possible for there to be an option for the effects to be turned off? I don't know if that can be added. Anyway, I noticed a minor typo but thought I should report it. In the following, the circled word should be "seizes" I think. I'm about an hour in, no issues so far. I do want to note that the new backgrounds are gorgeous. I absolutely love them! Can direct customers still contact you for Steam keys if we want them? Edit: Saw your post on the Steam forums from last week, question answered. Your decision to lock Callum's ending is an extremely good one. 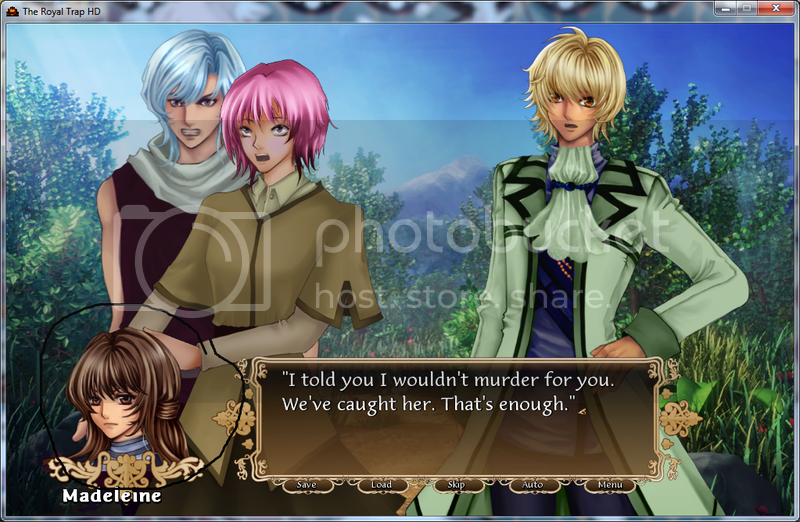 When I first played Royal Trap (when it came out), I stumbled into Callum's happy ending on my first playthrough. After that, I felt like I had all my questions answered and the game didn't have any replay value for me. I'm really excited to play it again now! I want to get the new version but I can't decide whether to ask for a Steam key or a new download. For some reason I feel like I don't want to overwrite the old game, and I don't know if that will happen if I ask for a Steam key. I think I could prevent that with a new download by naming the installation folder differently, but then again it might be better to just overwrite it and save disk space. You can ask for both, download the installer, and decide later about whether to install it or not! It actually shouldn't overwrite anything, the new version would by default install to a different location because it's now got 'HD' in the name, and it reads data from a slightly different save directory. Then that's what I'll do! Thank you. If we bought the game years ago, how do we download it again on Steam for free?